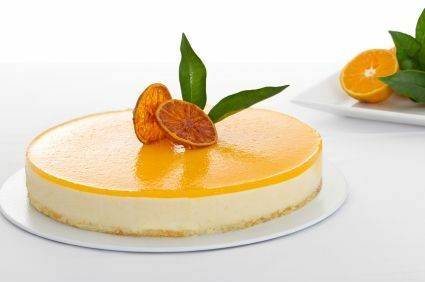 A zesty way to prepare a traditional cheesecake. A zesty way to prepare a traditional cheesecake. 2. Prepare the crust: Coat a 9-inch springform pan with cooking spray. In a medium bowl, mix crumbs, brown sugar and butter then firmly press mixture into bottom and 2 inches up the sides of the pan. 3. Prepare the filling: In a large sized mixing bowl, combine sugar and flour then add vanilla, cream cheese, and eggs. Beat until smooth. Add milk, sour cream, citrus juices and peels and beat until smooth. 4. In a separate mixing bowl, using clean and dry beaters, beat egg whites at room temperature at high speed until soft peaks form. Gradually add 1/4 cup sugar, 1 tablespoon at a time and beat until stiff peaks form. Gently fold egg white mixture with cream cheese mixture. 5. Pour into prepared crust and bake at 300º F for 1 hour or until set. Remove from oven and let completely cool on a wire rack. Cover and chill for 4 hours or overnight.